GROGNARDIA: Retrospective: "Glozel est Authentique!" From the perspective of 2012, it's hard to remember a time when Lovecraft -- or at least things tangentially related to Lovecraft -- weren't everywhere. Like nearly everything these days, Lovecraft and "the Mythos" are an industry, one whose pervasiveness has contributed in large part to the defanging of most of HPL's central ideas. I mean, it's hard to take seriously the notion of knowledge so unsettling that it can bring on insanity when you've got a plush Cthulhu doll wearing a Hawaiian shirt sitting next to you on a bookshelf. Once upon a time, this was not the case and, if I sound like an old man in bemoaning the violence pop culture has done to Grandpa Theobald's oeuvre, so be it. For and for ill, I suspect that Chaosium's Call of Cthulhu has played a significant role in the popularizing of Lovecraft and the Mythos. Back in 1981, when the game was released, I don't think any of my immediate circle of gaming friends had heard of Lovecraft, let alone read any of his stuff and this wasn't unusual among the younger generation of roleplayers in those days. Even today, I'd hazard a guess that the vast majority of people who read this blog first encountered Lovecraft as a result of Call of Cthulhu rather than being drawn to CoC, because they were fans of HPL first. There's nothing wrong with this, of course, except that, for all my love of Call of Cthulhu, I do think it (necessarily) distorts Lovecraft and his ideas in its presentation of them, so much so that the default assumption is that CoC investigators are Indiana Jones-like globetrotting adventurers rather than sensitive, bookish polymaths for whom merely interacting with other human beings is adventure enough. I mention this all because it might seem, in retrospect, like Call of Cthulhu always had tons of adventures and other materials to support it; that's not the case at all. Back in the first few years of the game's existence, Chaosium didn't produce a lot for it, which left a void filled by licensees, like Theatre of the Mind Enterprises (TOME). I know very little about TOME, so if anyone has any information about the company I'd be grateful. All I know is that, throughout 1983 and 1984, they produced about a half-dozen different adventure collections for use with Call of Cthulhu. 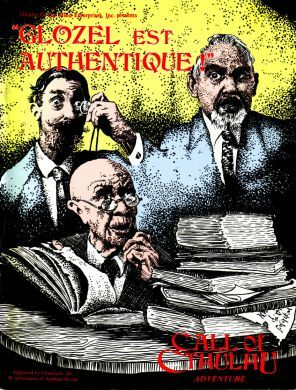 These collections were heavily advertised, including in official Chaosium products as I recall, but I only ever saw one of them, "Glozel est Authentique!," published in 1984. If it's any indication of the quality of TOME's other CoC offerings, I am grateful I didn't acquire them. "Glozel est Authentique!" is the title of the first of two scenarios included in this book. Written by Stephen Rawling, the adventure concerns a real world town in France, Glozel, which in 1924, became the center of an archeological controversy, when a young farmer discovered a hidden chamber in his field containing a wide variety of seemingly ancient artifacts. The artifacts consisted of pieces of glass and ceramic, human bones, and some clay tablets written in a strange language. The controversy centered on just how these artifacts were and their origins, leading to some outlandish hypotheses, as well as claims of fraud. As you can guess from its title, the first scenario makes the claim that the find is authentic and, of course, connected to the Mythos -- except in a very dull way. The second scenario, "Secrets of the Kremlin," was written by E.S. Erkes, whose name I recognize from several old issues of Different Worlds magazine. "Secrets of the Kremlin" isn't directly connected to the previous scenario and concerns, as you might expect, a Mythos connection to both the Russian past and present. And by "present," I mean Josef Stalin, who, according to this adventure, possessed a copy of the Necronomicon, as well as a Dark Young of Shub-Niggurath, which he imprisoned within the Kremlin. In many ways, "Secrets of the Kremlin" is the antithesis of its companion. Where "Glozel est Authentique!" is boring, even pedestrian in its revelations, "Secrets of the Kremlin" is laughable, a caricature of the kind of pulp adventure Call of Cthulhu frequently inspires. "Glozel est Authentique!" may not be the worst adventure collection ever put together for Call of Cthulhu, but it's pretty bad. At the same time, I feel for the authors of these scenarios, since I suspect, like so many gamers, they had a very skewed impression of what the game (and Lovecraft) was about. How could they not, when Chaosium's first adventure collection was Shadows of Yog-Sothoth? I love Shadows and have used it profitably several times, but it does tend to diminish Lovecraft's ideas somewhat. The same is equally true of Masks of Nyarlathotep, which many not unreasonably consider the greatest roleplaying adventure ever written. Still, a bad product is a bad product and "Glozel est Authentique!" is bad. I came to Lovecraft very early, and CoC very late, mostly because I could not fathom what fun could be had in role-playing, for example, The Colour Out of Space! When I finally came around to it, I really enjoyed it quite a bit - played The Haunted House as the first adventure, and later Masks. Didn't get the books until 5th edition, so it was impossibly easy for me to think of it as a completely different genre altogether. I still do. It has so much more in common with Quatermass and movies like Temple of Doom, maybe with a little X-files and Night Stalker thrown in, that I really don't experience the dissonance that most Lovecraft fans experience. SAN is a beautiful metric. Instead of attracting henchmen and establishing a keep, high level player find themselves in a straitjacket, locked in an insane asylum, contemplating the eschaton. Elegant stuff. But it sure as shooting isn't Lovecraft! Frankly, I think the only format where roleplaying Lovecraft would even be possible would be in solo "adventures," which is why some Lovecraftian text adventures strike closer to the ambiance of old Howie. I was just saying to my fellow librarians how much more visible Lovecraft is now. When I was a teenager in the 1980's, not even my English teachers had heard of him. Now I honestly believe he may be the best known of all pulp authors - I mean, does anyone think (say) Raymond Chandler is better known to the general public at this point? Although I think that has less to do with the Call of Cthulhu RPG and a lot more to do with the movies "based" on Lovecraft's stories... people know OF Lovecraft, but they often haven't READ him. Thanks for the warning about "Glozel..." Collecting Cthulhu products (even the dread heterodox plush Cthulhu) has been a pastime for me, and I'd considered bidding on this when it appears on eBay. If it's this bad, however, I'll pass. Regarding CoC and Lovecraft, I'd been reading the stories from long before I'd heard of the game, but I never really saw a conflict between the two, because I saw no need for the game to wholly imitate the literature -- a fruitless task, in my estimation, because the different forms (stories vs. games) have different needs. Also, if CoC is more "adventurish" than most of Lovecraft's tales, which I'll grant, I think that's because it incorporates as much from the spirit of REH's horror tales as it does from Lovecraft. (Having recently read the collected horror stories of REH, I was struck by how many would fit in CoC.) For a game, that's not a bad thing. I've never played CoC, but it may not be fair to blame it for distorting and defanging Lovecraft's work. People have been doing that since Derleth. I'm sure many people got a diminished and distorted impression of Lovecraft long before CoC was released through the writings of the 'Mythos' authors. I have all the TOME adventures, and they generally take the spot that lower-quality Judges Guild adventures did matched up against the better quality TSR releases. None of them are essential purchases for the CoC enthusiast who isn't primarily a collector. "Pursuit to Kadath" is probably the best of the lot, but compared to the well-written and high production value Chaosium offerings, it still suffers in comparison. Another warped manner of introduction, probably mentioned before: the Cthulhu Mythos section of TSR's Deities & Demigods, including the Erol Otus artwork. Yeah. I know that Gygax was a fan of HPL, but throwing Cthulhu in with a boatload of deities from other mythologies, felt like making a dessert out of chocolate cake and sauerkraut. One doesn't kill Cthulhu with a +2 dagger of smiting or some such...one uses said dagger to poke out one's own eyes after going irrevocably mad at the sight of Cthulhu. In addition to D&DG, the 1e DMG refers to HPL several times, as did articles in early issues of The Dragon. In my case, the pointers in the DMG and the D&DG lead to my intro to HPL's fictions. I'm something of a latecomer to CoC (the RPG), if not HPL's fiction. I've picked up some of the early Chaosium stuff via RPGNow and Chaosium's own site in PDF...and it's not an exaggeration to say that even Chaosium didn't know how to write Call of Cthulhu scenarios in the early days. Some of the early Chaosium efforts read like glorified dungeon crawls, which clearly is not getting the point. I've always believed that in the very beginning, Chaosium saw dollar signs in attaching the Lovecraft/C of C name to their game, and didn't really think it through. Still, things changed. While Masks doesn't really get at the heart of the Mythos (I've likened it to Indiana Jones meets H P Lovecraft), it's a step in the right direction away from some of the early Call of Cthulhu stuff. As for problems with the literature vs. the game, these are inherent in the differences in the form. First of all, if you want to capture the essence of HPL, your game should contain at most, one player and one Keeper. That's it. Lovecraft's stories were almost always about one person confronting weirdness he/she was in no position to cope with, and then either dying, or far more frequently, going mad. There also would be no campaign in Call of Cthulhu, nor character improvement. All games would be one shots (and in fact, I think C of C works best as a one-shot game, for the most part). Lovecraft wrote short stories and a couple of novellas. The concept of a character in a Lovecraft story lasting long enough to live while maintaining a shred of sanity through a second story, or in some way a character in a Lovecraft story becoming a better person after exposure to the Mythos is too ridiculous to do anything but laugh. Still, I've run and played in, some amazingly great horror games using C of C that even had a touch of a Mythos feel to them. In fact, I ran a Delta Green game just last weekend and the players and I had a blast doing it. It is possible to distill some of the essence of Lovecraft, even if one can't recreate the exact feel of his stories. The Dunwich Horror had an "investigator party" very fitting of a CoC game afaic. Yeah, in general the stories focus on individual protagonists, but thats true of pretty much all the genre fiction rpgs are based on. The games are different from literature. Dunwich Horror is one I haven't picked up, I'm afraid. Sounds like I may have to change that. Wracking my brain to recall how exactly I bumped across HPL, but it certainly via a reading route rather than a gaming route. Probably either via REH, who I read voraciously, or Brian Lumley. CoC always seemed to work best when it was the cultists and conspiracists, and even the skeptics and law enforcement that most commonly engaged the players and kept them from actually glimpsing a minion, let alone the mind-shattering Old Ones. But withholding Christmas is always a precarious task, if you want to keep players playing (they're there to see Cthulhu, damn it!). And that expectation always led to "encounter inflation" that nearly always inserted a pedestrian commonness into the game. One of my best runs on CoC was taking the characters back to Innsmouth in the modern era, after it had been sealed off and occupied by naval intelligence. That led to a whole unfolded campaign where the U.S. military had it in its head that the Old Ones were some kind of super weapon of deterrence, and of course Cold War Soviet agents were well on to this, too. All that played in the background, but it did seem to ameliorate the common understanding these creatures did exist, and it injected a particular kind of horror that officials with their hands on the levers of power were little better than extremely well equipped cultists. Gave new meaning to the term MAD. On a similar note, the best Lovecraft scenario I ever ran was using the AFTERMATH gun rules with a heavily armed Band of Brothers trapped behind enemy lines after the Battle of the Bulge. When Cyäegha raised its hoary head, I think the players really did think they were losing their marbles, it came out of nowhere and was entirely unexpected from a game system of Bradley tanks and high explosives. A pulp magazine story on hand gave them the clues to survive, to put the Old One back in his well, not one of these brave boys having the slightest Mythos knowledge. I think there's something to that, that CoC play only really works when it goes completely off the rails and into unexpected areas the players can't prepare for. That's why, when you break out CoC—glorious a game as it is, I love it—you have instantly telegraphed an expectation and a familiarity of game play. My friends and I adored CoC and played it frequently from the moment it appeared on the market, but we also firmly believed (and I still do) that it succeeded in spite of itself. BRP is not an especially good set of rules to begin with, and it was a very poor choice to be the foundation for a game like CoC. Whether any particular CoC "adventure" flies or crashes depends almost entirely on the GM's talent at making silk purses out of sows' ears. I find Trail of Cthulhu to be a much better choice for purist-style games, and Realms of Cthulhu (Savage Worlds) for pulp-style games. Yet my group and I still rely on CoC. As much as we kvetch over its shortcomings (and we do, at each and every get-together), it's a comfortable old pair of slippers that we can't bear to throw away. I'm going to have to disagree with you re. BRP. Yes, it's showing it's age at this point (so is Old School D&D), but when one considers its been in basically the same form since 1981, it's done pretty well. I like the rather logical progression of skill improvement. It's also a very simple game to teach to new players. Far easier than most modern games. Trail of Cthulhu looks interesting, and I admire Robin Laws as a designer. The concept of characters never having to miss that Spot Hidden roll to avoid picking up the one crucial clue is certainly enticing, but as a GM, I've always used Masks of Nyarlathotep as a guide when running a horror game. If your mystery game is utterly dependent on the heroes/investigators locating one specific clue (and goes off the rails if they don't), it was probably doomed from the start. I'll almost certainly pick it up one of these days. it succeeded in spite of itself. BRP is not an especially good set of rules to begin with, and it was a very poor choice..."
BRP is a terrific system, was a great alternative to early dependance on D20's, and the way I most heard it described for Call of Cthulhu in the 80's was "elegant," a word I still use for it. Sure, I would not want to use it for Superhero stuff or even standard Sci Fi, but for fantasy and early century stuff I think it is the bees knees! The excellent Glorantha setting was not the only reason Runequest gave "800 lb gorilla" D&D a run for it's money when no other fantasy system ever came close. I do think that BRP has its obvious weaknesses. It deals with firearms in a rather quirky manner (no coherent rules for cover or concealment beyond a GM basically pulling them out of their butts), and it really breaks down in handling autofire (the notion that one gets more hits the more bullets one fires in a burst is ridiculous). Still, there's more to like than dislike to the system as a whole. I wouldn't call BRP "elegant," but it does have strong internal consistency. It's probably the first RPG entitled to make that claim. It works well for Runequest and plays a big part in establishing the gritty feel of Glorantha as a setting. But BRP is too fiddly (IMO) for a game like CoC; it emphasizes all the wrong things. YMMV, as always. That's where ToC shines; not because you can't fail a Spot Hidden roll but because the whole package is geared toward the pacing and dramatic needs of a mystery/horror game. In terms of weaponry (and bare fist/kick attacks), yeah I have houseruled just a touch. I for sure will look at the auto burst. Things I don't like the second I see them I tend to change in any system I use. But I don't think combat stuff affects anybody running a game btb as much as it does mine, which I want to be a bit more pulpy (without being a full-on pulp daredevils type game). Fiddling, but not on a large scale. Well, in standard 1920's C of C, the oddities of autofire don't crop up much, as the only AF capable weapon in the core rulebook is the Thompson SMG. When you play or run a lot of Delta Green though, as I do...this flaw suddenly becomes a lot more noticeable. An additional comment, I don’t think Lovecraft, per se, represents the best source for CoC roleplaying, primarily because of both the passivity of his protagonists and the haphazard way in which they passively collide with the Mythos. “Call of Cthulhu” is, without a doubt, one of the most passive narratives in the history of fiction, with almost all of it playing out through dusty old newspaper clippings. I look to Colin Wilson’s “Return of the Lloigor” as a much more active example of how to play out the Mythos. Almost all the action comes as a result of nefarious riffraff, common folk with bad teeth and nothing to lose, and the main character’s growing horror that a simple punch to his stomach from one of these lurking thugs might be enough to kill him. His rising awareness of the terrible cost for low gain in trucking with these blowsy barflies only adds to the sense of dread. All that, then, is laid over the backdrop of his growing horror with the Mythos. The old TV show, “The Invaders” was probably as good as anything to illustrate how Lovecraft should be played in an active, engaged setting. There's something to this, Pat. You've kind of hit the nail on the head. Most of Lovecraft's protagonists are passive to the extreme, and would make terrible PCs. Got the second game of my first Cthulhu campaign in over a decade tonight (I think it’s going to pan out into a good ‘un, so I’ll be posting now and again about it), and it sure feels fine. Like an old friend. Been chomping at the bit for around two years at least, and here it is. I think the players are liking it (only my one player from the 90’s is in the current group, and she has extensive CoC experience. The other guys are minimal in their Lovecraft knowledge. I’m happy to be turning another passel of players into HP fans!). I’d say the characters in my games are “semi-pulp.” They ain’t Indy Jones, and the characters are not always badasses, but I do prefer characters that can get all action (in a realistic way) when called for. And the human level of violence is swift and brutal, with lots of running around and car chases, so there is a for sure pulp flavor. I’d rather there be that, than the typical Lovecraft “hero” who gets feint when he smells a fart, or meets a black man. I Love H.P. and the stories, but to me they are a set up for something a little more. I like campaigns with CoC so I can play more. A campaign with constant character death of shivering academics every game turns into a joke. Guns against Cthulhu, sez I! From lots of previous campaign experience going back to the 80’s, I never much liked the big adventure modules for CoC. I did mine for some ideas, but I much prefer to start a campaing with a few hooks and ways to go, add into the mix the character backgrounds, and let a campaign grow and evolve naturally. If find CoC to be very good for that. I’m lovin’ it! I had one TOME adventure called 'The Arkham Evil'. It had some interesting settings, but it was pretty bad, mostly because it was a railroad adventure of preordained events which didn't really require the participation of PCs. I found CoC later, and still later read the books. I first read Lovecraft when my High School literature teacher recommended him to me because of my enjoyment of Poe. I should track him down and thank him. I was already vaguely aware of Lovecraft though, through stories in Heavy Metal and various 'underground' comics... also episodes on Night Gallery and some mentions in horror magazines that mentioned movies base on his writing. There was also 'psychedelic' band named after him. So, at least in my neck of time & space HPL wasn't particularly obscure. It seems to me that part of the reason Cthulhu has become a plush toy is that, like all great monsters... it really is a frightening concept... that has to quickly be made into a joke... nervous laughter in the darkness to stop from screaming. Perhaps I'm showing my advanced Grogdom, but I actually got into Lovecraft way before CoC. Lovecraft's use of the English language amazed me and was a major factor inspiring me to become a writer. I only played CoC a couple of times. Luckily I had a GM who had read Lovecraft and wrote his adventures accordingly. I experienced Lovecraft first by way of an SF illustration book that had painted pictures of creatures from across the history of SF and fantasy - I wish I could remember who the artist was. It wasn't until several years later that I first picked up a Lovecraft book, though, and it didn't take long to hook me. I've actually never played Call of Cthulhu, but I have played some of the derivative board games like Elder Sign and Mansions of Madness. Games like that can never match the terror of a good Lovecraft story, mainly because standing on their own, his creatures aren't really that scary. They're just weird. It's the atmosphere that wins the frights. Probably Wayne Barlow's Guides to Extraterrestrials and Fantasy. Two fun, beautifully illustrated books. Re. Lovecraftian board games, if you haven't already played it, Fantasy Flight's Arkham Horror is fun. Very pulpy, and the characters in the game look and play like just about every 1920's Call of Cthulhu team of investigators I've ever played in or run. The rpg introduced me to Lovecraft, and it remains my favourite rpg to this day. As for it not being Properly Lovecraftian, The Call of Cthulhu and The Dunwich Horror are good signs that even HPL liked a bit of globe-trotting cultist-bashing now and then. I've still never laid eyes on the interior of a CoC rulebook (though I would like to one of these days). I came to HPL in high school via an interest in dark fantasy literature. I have to say, I didn't "get" Lovecraft at all then. At the time I didn't find his stories either particularly engaging or scary. My perspective is different now, after having reread much of his work as a (somewhat) older adult. I have one TOME book in my collection, "Whisperers in Darkness (and other tales)." I'd seen their ads in Dragon magazine many times in the 80s, but never saw any of their products in any gaming store except this one time. And it happened to be the book that contained an adventure about the Lost Colony of Roanoke, which had sparked my imagination as a kid totally independently. As a renegade Lovecraft's fanboy, I look down on his mythos as a crass imposture. It's hard to take seriously a series of horror tales starring the Evil Seafood of Doom. If I sound like Edmund Wilson raised from the tomb with a revenge (Edmund who? ), so be it. The genuine article is Algernon Blackwood. Everything that makes HPL cosmos great was taken from 'The Wendigo' and from 'The Willows'. The rest is purple prose and guys in green rubber suits. Cthulhu, as depicted by Lovecraft, is a fairy-tale giant which barely poses a bigger threat than a plush toy. If the big C was about to destroy the world-as-we-know-it, why procastinate? I can't stand that, at the end of 'The Call of Cthulhu' tale, there's still people left around. And the number of casualties is disappointingly low. Stupid Squidhead! if only it had eaten New Zealand... ¡what the heck! in the real world, if such a hulk as R'lyeh had emerged from the ocean, the tidal wave alone would have sufficed to wipe out every island and shore around the Pacific Ocean. Farewell Tokio, goodbye Los Angeles. Lovecraft says truth and nails it when he claims that mankind is an accident which won't last. He screws it when makes a point of babbling about functional magic or worldwide occult conspirations. These are superstitions which undermine the core premise. Magic is the delusion that puny humans can tame cosmic forces. Which contradicts the premise that mankind is irrelevant on the cosmic scale. Ditto about secret societies and doomsday plots. They give the false hope that there's somebody pulling the strings, that the end can be indefinitely delayed or that not every human effort is worthless. Lets figure that you are a lazy pig who hasn't bleached his bathroom in ages. To the point that the bacteria have become sapient and entire civilizations have risen and fallen in your bathtube. Would you care a dime about it? would you mind if bacteria are worshipping you? would you ever notice? Can them do something to stop you from awakening and bleaching the bathroom? Earth is the Old Ones' bathroom, and we are the microbes infesting it. The chances for puny mankind to awake/hinder Chtulhu, summon/dispell Yog-Sothoth or whatever, are null. It would be easier summoning a hurricane or a volcano. You could pray the moon to stop as well. If someday you met an Elder One and still want a chance to live, you'd rather get off its way as fast as you can. Nothing else works. The Articles of Dragon: "Hold That Person!" Open Friday: Who Are These Guys?